How have we dealt with water woes, the coastline, wildlife and development over the years and where are we now? The environment is the subject of a Conversation at the Crocker on Tuesday, November 11, starting at 7 p.m. The local environment is the subject of a Conversation at The Crocker, on Tuesday, November 11, starting at 7 p.m. at the Crocker Memorial Church, 1260 12th Street (Pioneer Park), Sarasota. Organized and presented by the Historical Society of Sarasota County and sponsored by SARASOTA Magazine, this public conversation is free to Historical Society members and students. Guests, $10. Proceeds help maintain the two historic properties at Pioneer Park, The Bidwell-Wood House (1882, Sarasota’s oldest private residence) and the Crocker Memorial Church (1901, Sarasota’s oldest surviving church building). Tours of both historic buildings are available prior to the Conversation. “Many of us moved to the Sarasota area for the climate, the beaches, to boat on the bay, fish in the Gulf of Mexico, and enjoy the beautiful Old Florida rural serenity,” said Howard Rosenthal, President of the Historical Society. “But, this part of Florida has a fragile environment and challenges to it are increasing as the county grows and struggles to support increased development. There are water issues, conservation of resources and decreasing habitats for wildlife. At this Conversation we’ll hear from four experts about what our environmental challenges have been in the past and what they are now.” On stage the evening of Tuesday, November 11, are Julie Morris, Jon Thaxton, Becky Ayech and Glenn Compton. Julie Morris (pictured here) came to Sarasota in 1970 to attend New College and focus on Environmental Studies. She led the Florida Sierra Club in the 1980s and was active in Sarasota and Florida issues related to the coast, wetlands, rivers and wildlife. In the 1990’s she was a Commissioner of the Florida Game and Freshwater Fish Commission and was the first Chairman of the Florida Fish and Wildlife Conservation Commission. Morris managed fish in the Gulf of Mexico for nine years as a member of the Gulf of Mexico Fishery Management Council. She has worked at New College, first as co-director with Jono Miller of the New College Environmental Studies Program, and now as Assistant Vice President for Academic Affairs. Former Sarasota County Commissioner Jon Thaxton (now Gulf Coast Community Foundation Director of Community Investment) is a fourth-generation Floridian who was born near Osprey and began working at his family’s real estate business age 14. He began his environmental advocacy at Venice High School in 1974 as a founding member of the Ecology Club and has never stopped championing the environment. 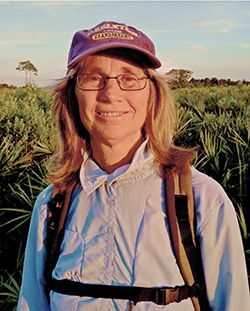 Thaxton was awarded the 1,000 Friends of Florida State Growth Management Award and was twice named the Nature Conservancy’s Grassroots Activist of the Year. In 1996, he was featured in National Geographic for his work in preserving endangered species. Thaxton’s involvement in both business and environmental issues contributed to his first successful campaign for the Sarasota County Commission in 2000 and his reelection in 2004 and 2008. Jon Thaxton is respected throughout Florida as a leading advocate for protecting the natural environment. Becky Ayech has lived in Miakka (the oldest settlement in Sarasota County) for 34 years. She has served as the president for the Environmental Confederation of Southwest Florida and president of the Miakka Community Club, a civic organization which preserves and maintains the rural way of life in Miakka as well as a 100 year old Schoolhouse. She is immediate past chair of Fisheating Creek Settlement Advisory Board, a former member of Sarasota County Planning Commission, policy consultant for Florida Water Coalition and co-founder of the SWFWMD Environmental Committee. Becky and her husband own a sustainable farm where they raise sheep, chickens vegetables and fruits. Glenn Compton is Chairman of ManaSota-88, past member of the Venice Environmental Advisory Committee, past supervisor with the Sarasota Soil and Water Conservation District and Venice High School Science teacher for 30 years. ManaSota-88 is a Florida non-profit organization, created in 1968. Its environmental protection efforts, protecting the public's health and preservation of the environment, span more than 40 years. The organization's commitment to safeguard the air, land and water quality is aggressive and uncompromising. Operating revenues are derived totally from private citizens. For more information about this Conversation and the whole season of Conversations at The Crocker, contact Linda Garcia, Site Manager, Historical Society of Sarasota County, 941-364-9076 or hsosc1@gmail.com.